Today we dove into the history of WWI in the Soča river valley before a drive to the coastal region and Croatia. A morning visit to the WWI museum in Kobarid. After a short ride, we stopped for our “Light Lunch” at the Lisjak winery and a delicious wine tasting. Amusing buddy introductions after a bit of wine. During our visit to the Kobarid WWI museum our local guide, Zeljko, shared the history of WWI from the human perspective and showed how it shaped the development of the region to today. Being greeted like family at the Lisjak winery and then being treated to an amazing lunch in the tasting room. My favorite wine was Vitovska Grglanja – a white, but many in the group liked the stronger red Tehran wine which is the winery's speciality. Croatian passport stamps at the border! Walking up the steep main street to Motovun's castle hotel - the hike was worth the views! Searching for the town's 13 Venetian lions (we only found 9) and enjoying an amazing sunset over the valley. Dinner with friends as the last glow of pink faded from the skies. Kobarid is such a small town, it affords only a short stroll. 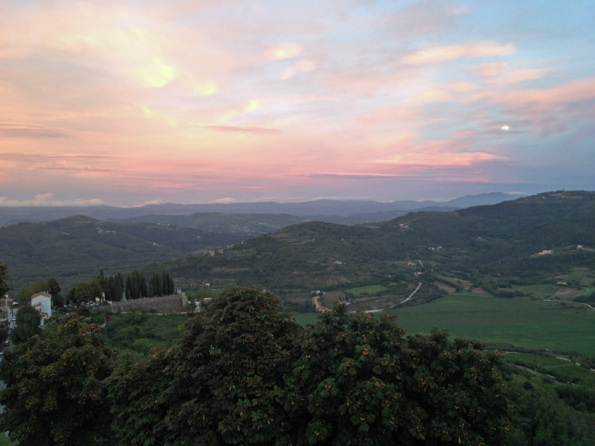 Motovun is equally small, but when you're on a treasure hunt for Venetain lions and you get distracted by amazing sunsets you can sure rack up a lot of steps and flights of stairs!